John Swallow, soon to be former Attorney General of Utah, on Thursday afternoon announced that he would resign, effective December 3. Reports from sources in the legislature and close to the Governor and Lieutenant Governor’s office assert that no deal has been offered to Swallow. Perhaps Swallow finally saw the writing on the wall. Perhaps not. In any case, he’s leaving, but the fallout from his actions, like touching the tar baby, will continue to taint any too connected to him. One night, while Babylonian King Belshazzar feasted, a disembodied hand appeared to write on the wall. The King called for Daniel, an Israelite who was known for interpretation of dreams. “You have been weighed on the scales and found wanting,” said Daniel, informing Belshazzar that God had “numbered the days of his kingdom” and that the kingdom would soon be divided between the Medes and the Persians. That night, Babylon fell, and Belshazzar with it. 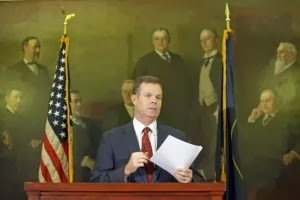 In the ten months since John Swallow took office as Attorney General of Utah, Utahns have been exposed to a mountain of accusations and allegations against its chief law enforcement officer, many of which were alleged prior to the election in November in 2012, but for one reason or another never caught traction until after Swallow took office. As former business partners and associates, donors and friends–or former friends–began to come forward with stories of malfeasance, influence peddling, and extortion, to say nothing of attempted bribery and attorney ethics violations, the allegations began to carry weight. News that the Department of Justice, District Attorneys, the Lieutenant Governor’s Office of Elections, and the Utah Bar were investigating the allegations only added legitimacy to the allegations. By early summer, it was incumbent on the legislature to consider the matter, and a special House committee was set up to investigate. Even when the feds dropped their case, never giving a clean bill of health to the AG, but just ceasing to investigate, the amount of information uncovered continued bely Swallows protestations of innocence. Even when his hard drive turned up broken, his emails were found deleted, and his calendar cleared, Swallow maintained that it was typical behavior. In the end, his fall is not due to his weakness as an attorney or unsavory friends. His underlying defect is that he sees world through the magnifying glass of his own prevarication and half-truths. When measured by the public, his integrity was found wanting. Swallow’s opponent in the General Election, Dee Smith, claims to have known about the accusations prior to the election, but says that he decided not to use them. While Democrats will trumpet this as a sign of his character, I think it only did a disservice to voters. Campaigns are about providing information to the public, and failure to inform the public about information relevant to their decision is an abrogation of duty. Now, Swallow is stepping down before his election can be invalidated, largely due to the in-depth work of the House Special Investigation Committee which (at a cost of just about $1.5 million) discovered the whole scale destruction of Swallows emails and electronic storage. An unreleased report (UPDATE: report has been released and can be read here) coming out of the Lieutenant Governor’s office is believed to find that Swallow filed deceptive campaign reports to hide his finances from the public. It would seek action by a judge to invalidate the election and call for a special election to replace Swallow. By stepping down, Swallow allows his replacement to be by appointment of the Governor and remove one more claim against him. Having already spent around $300,000 on legal fees, Swallow’s just plain out of money to fight the invalidation of his election in court. And yet, by stepping down Swallow doesn’t cleanse the slate of the investigations into his actions. District attorneys in Davis and Salt Lake County will continue to investigate the allegations against him. If the information uncovered by the House Special Investigation Committee is any indication of what the DAs have, then there is more than enough to implicate not only Swallow, but accomplices, too. The cost has been high, the process messy, and more Swallow associates may face the hard reality of subpoenas, GRAMA requests, and criminal investigation. I would not want to be one of the campaign staffers or insiders that worked too closely with Swallow to secure his election. They will, if they are not, be under scrutiny of the district attorneys for some time to come. One is inclined to remember that the cost of removing corruption is high. It is only accomplished with contention and great effort, and can only result in the loss of public trust. If there is one elective office where trust is especially required, it is that of the attorney general. When that person becomes advisor to the legally questionable–whether on the financing of poker payments or the establishment of questionable get rich quick schemes in the states–to the detriment of the rule of law, the public trust is lost. Which is exactly where Swallow found himself. Finally reaching elective office after a decade of effort, he may have come to realize that the means he employed to get elected were the very means that resulted in the loss of the public’s trust, and even if the ends did not justify the means, the public did not like, nor did the law tolerate, the means. He is alleged to have selected as his friends and associates questionable characters and shady political operatives, applied as his methods deceptive campaign financing and lies about his opponents, and facilitated his fundraising through shell companies, non-profits, and other organizations out of the public eye. By the time rumors circulated that criminal charges were imminent–if not for Swallow, then for others–the “embattled” attorney general finally noticed the writing on the wall. Hopefully, we can do better as voters next time around. Hopefully, we can do better as a state.